I will return to the content of this tweet later in this post, but it reminded me of a conversation I recently had a with one of my friends regarding why I left FB and G+. When I asked him, how he would react if a large part of his network connections was excluded from one of his networks, he acknowledged this, but also pointed to a difference in our connections; “But because you’re working with SL, you have more friends with unusual names and unknown identities – and you’re used to dealing with that – most people aren’t”. I found this very interesting because it points to two common conceptions regarding the pseudonym/nymwars issue. First of all, my friend had the impression that mainly avatars (or other fictional characters, sic) need/want to use pseudonyms. This is by far the case, but it is sadly a very common misconception, and so I want to point to a webpage that was created in defense of pseudonyms and shows the many different groups of people, who may need/want to use pseudonyms for various reasons: the my name is me webpage. 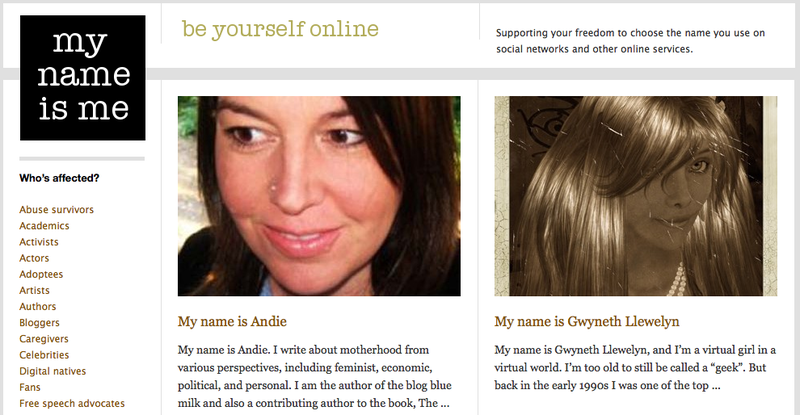 “My Name Is Me” is about having the freedom to be yourself online. We want people to be able to identify themselves as they wish, rather than being forced to choose names by social networking websites and other online service providers. Websites such as Facebook and Google+ ask you to use a name that conforms to a certain standard. Though their policies vary, what they would like you to use is the name that appears on the ID in your wallet, your employer’s records, or on the letters your bank sends you. They don’t understand that many people go by other names, for a wide variety of reasons. Take a look at some of these heartfelt and personal stories – it really just isn’t us “strange” avatars that need/want pseudonyms – and even so, I believe we all, avatars included, should have the right to choose! Additionally, The Geek Feminism wiki has another list of “Who’s harmed by “Real names” policy”, and the Electronic Frontier Foundation (EFF) makes A Case for Pseudonyms. Looking at these stories, nobody in his/her right mind can dismiss the need for pseudonyms some people have to enable them to interact safely online. Or so I thought, but let us return to the content of Botgirl’s above mentioned tweet. Botgirl links to a post on her blog wherein she quotes NPR‘s Andy Carvin, who met Google’s Executive chairman, Eric E. Schmidt at a recent film festival. He replied by saying that G+ was build primarily as an identity service, so fundamentally, it depends on people using their real names if they’re going to build future products that leverage that information. Regarding people who are concerned about their safety, he said G+ is completely optional. No one is forcing you to use it. It’s obvious for people at risk if they use their real names, they shouldn’t use G+. Regarding countries like Iran and Syria, people there have no expectation of privacy anyway due to their government’s own policies, which implies there’s no point of even trying to have a service that allows pseudonyms. I’m trying my very best to ignore the arrogance and stupidity of Schmidt’s comment and to keep a civil tone here, so I’ll let it be for now. However, let me just finish by pointing to the second part of the statement from my friend where he implies that acceptance of pseudonyms requires (positive) experience. During this period of nymwars, but also during my research in SL, I’ve struggled to understand the fear some people have towards pseudonyms, or as my colleague, Mark Childs calls it: the obsession people have with “real” identities. Based on my own research experience, I think my friend’s stance is quite plausible, people fear the unknown. And identities that do not conform to “real” or “normal” standards do provoke ontological/existential questions. I have no other particular qualified (read: academic referable) explanations at this point, but it is a topic, I will continue to investigate. On August 30th, Andy Carvin posted a “a transcript of what Google CEO Eric Schmidt said in the Q&A at the MediaGuardian Edinburgh International TV Festival, so you can see his direct words rather than my paraphrasing of it”. Really interesting post. I think it’s appalling that someone would create a social networking system that deliberately (and arbitrarily) excludes many people. To say that those who can’t use their “real” (and I use that term ironically) identities have to go somewhere else is creating a two-tier system. Not only that, but I’m assuming that the reason for using people’s physical world identity is that somehow an identity that exists solely or primarly online isn’t authentic. That attitude undermines much of the value of online interaction and reminds me of an attitude that still persisted into the late 90s,that an online community was an oxymoron. No-one believes that now, so why does Google still believe it (at least FB does permit pseudonyms). Since G+ won’t allow my friends to be part of it, I won’t be joining it.